Best deal in building to learn? 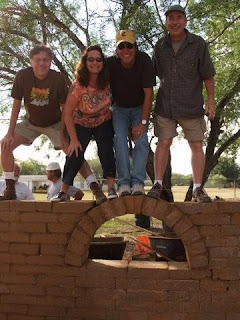 $50 to spend a week in East Texas, working on an Earthship with Michael Reynolds and crew! Earthship Biotecture is announcing a new opportunity to learn alongside the Earthship Biotecture crew. 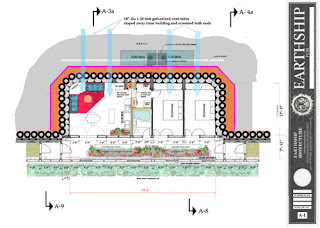 We will be building a new 2 bedroom Global Model Earthship halfway between Crockett and Lufkin, Texas. Construction will commence near the end of October and continue for one month into November. This is a chance to learn Earthship construction techniques like tire pounding, bottle wall construction, mud plaster while working from the ground up on a new Earthship. Interns work alongside the Earthship Biotecture Crew led by Michael Reynolds. We will accept 12 interns per week on a first come, first served basis. There is a $100 scheduling fee ($50 is refundable upon your arrival at the site). To sign up call us at 575-751-0462 or follow this link and fill out the form. What do you want a windmill for? This man changed lives with the ones he built. The folks at Tierra y Cal have three workshops planned. Two in October will take place in San Miguel de Allende. The November workshop will be in San Antonio at the AECT factory. If you attend be warned that Jim will convert you completely to faith in nopal juice, lime plaster and lime stabilized block. Two earth building companies and their personnel are pooling their talents to bring you this class. From Texas, Lawrence Jetter and crew of Advanced Earthen Construction Technologies bring their knowledge of pressing machinery. From San Miguel de Allende, México, Jim Hallock, Mónica Healy and Jeff Rottler of Tierra y Cal, Proyectos Sustentables, bring their knowledge of lime stabilization in combination with compressed earth block construction. Students who persevere through all of the sessions through Q. and A. on Saturday afternoon will receive a Certificate of Completion. Class cost includes an Earth Block Construction manual. 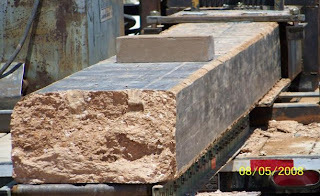 8:15 - 11:45 - How to Build a Compressed Earth Block (CEB) Building - Foundation through Bond Beam. The partners of Tierra y Cal present the step-by-step sequence using the manual you will have received. 1:00 - 4:45 – Soil selection and block manufacturing with Lawrence Jetter and lime stabilization with TyC. You will have the opportunity to press and test some blocks (bring 5 gallons of your dirt if you wish), and help to operate a pressing machine. 8:00 - 11:45 – Hands-on construction of a small CEB building.The class will learn to build a wall to the speed lead and string and construct an arch using blocks pressed on the site. We’ll place door and window bucks and set in an electrical circuit with a few plug boxes as we build the wall. 1:15 - 4:45 – Construction continues. 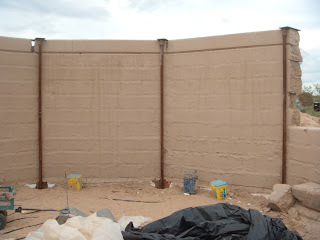 8:00 – 11:45 – We are again at AECT’s facility with a focus on lime and clay plasters. 1:15 – 3:00 – Plaster continues. 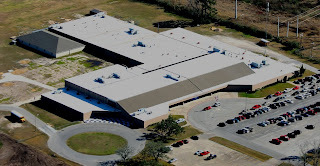 3:00 – 4:45 – Q. and A.Certifi cates of Completion handed out. A DISCOUNT OF $20.00/PERSON WILL BE GIVEN FOR EARLY REGISTRATION, PRIOR TO OCTOBER 15. REFUNDS (MINUS $30.00 ADMINISTRATION FEE) WILL BE GIVEN FOR CANCELLATIONS PRIOR TO NOVEMBER 1. THIS CLASS WILL BE CONDUCTED IN ENGLISH ONLY. Do you want to know the characteristics of the blocks and to construct a dome or vault? Come to our theoretical-practical course in San Miguel de Allende, Guanajuato, Mexico,"MEXICAN VAULTS AND DOMES WORKSHOP" October 22 - 24, Featured Presenter: Arq. Ramón Aguirre, (UNAM – Posgraduate in light covers and roofs, UNAM). · Study the historical and cultural importance of the vault, as architectural knowledge passed through generations. How long is the workshop? 3 ½ DAYS Our goal is to present all the information we can about the modern method of constructing vaults with compressed earth blocks. We require your participation for three and one half days to complete the course. You will leave with new understanding of this local and traditional method of economic construction combined with knowledge and experience with Stabilized Compressed Earth Blocks…the truly environmental building material. October 29, 30 and 31, 2009 Compressed Earth Block (CEB) Construction, CEB machines and plaster in San Miquel de Allende. This workshop is very similar to the one offered the next week in San Antonio. The cost in US dollars is $275 per person which in Mexico includes lunches. Call (0155)2222 25 49 (044 55) 1798 7131 Or email monicahealy@tierraycal.com for more information, a brochure in pdf form or to make reservations. San Antonio's first certified Permaculturist, Dodrick Evans has established the SA Permaculture in Practice meetup group. Already the group has two meetups planned. On Thursday October 1, 2009 Doddi will lead a workshop on medicinal herbs. Learn about the wealth of medicinal herbs that can be grown in local gardens at a 1 hour workshop taught by Doddi Evans. The workshop will focus on the role of herbs and herbal medicine in preventing and treating disharmonies. "I'll discuss how to use garden plants for health and wellness, including how to make teas and other preparations from plants and weeds you'd find in many backyard gardens," says Doddi. During the workshop, Doddi will discuss sources of medicinal plants, how to select plants, what plants do well in San Antonio gardens, and how to harvest herbs. There will be a sign by our sponsor Permaliving with my name "doddi" on it. To find the place and more details go to the SA Permaculture in Practice meetup site. On Sunday October 18 at 12 pm the group is planning a field trip to an intentional community that practices permaculture. The term Intentional Community is inclusively used for eco-villages, co-housing, residential land trusts, communes, student co-ops, urban housing cooperatives, alternative communities, and other projects where people strive together with a common vision. 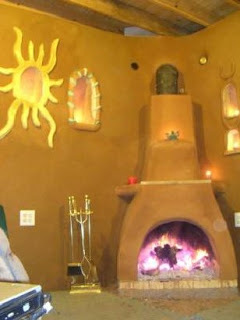 We'll have a day visit to the Santuario Sisterfarm intentional community. This will be an awesome opportunity to see some permaculture in practice! Just remember, every permaculture site is different. "Santuario Sisterfarm is a nonprofit organization founded in 2002 by Latina women and Dominican Sisters and co-directed by Adrian Dominican Sisters Carol Coston, OP and Elise D. García, OP. Located in the Hill Country of south-central Texas and rooted in the rich multicultural legacy of the Borderlands, Santuario Sisterfarm is dedicated to inspiriting the work of transforming human relationships with Earth and among ourselves, from dominance to co-creative partnerships." 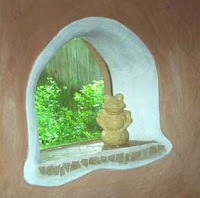 I've visited several eco-villages and intentional communities around the world. Most that I've visited were composed of people from diverse social-economical, ethnic, professional, religious, and cultural backgrounds, who share the common goal of living sustainably. Economic Sustainability - Micro-Industries (small business that can be established utilizing local resources and community member's skills, educations, professions, and talents). Cultural Sustainability - Events and activities that address social needs of every member of the community. Enviromental Sustainability - Use of rainwater catchment, solar and wind energy, organic gardening, and recycling etc. Permaculture is often practiced by Intentional Communities because it's ethics and principles can easily be applied to address all of these needs. During our visit to Santuario Sisterfarm, I recommend you to look for evidence of these three elements and assess their levels of functionality. Santuario Sisterfarm requests a $10 per person donation for the tour of their permaculture site. So, please RSVP as soon as possible so we make car-pool arrangements and we may get a group package! Dodrick Evans of Permaliving.com has an ambitious series of workshops and presentations in the works. At the August San Antonio Sustainable Living meeting, he and Adhana McCarthy gave a presentation on the principles of permaculture. Their presentation was put on video by OrganicTexas. 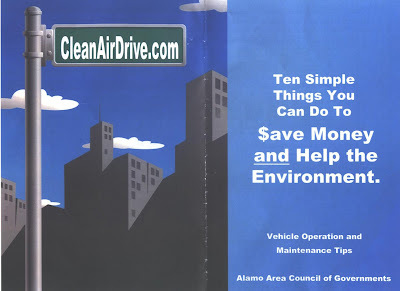 CleanAirDrive.com is a partnership of the Metropolitan Planning Organization, the City of San Antonio, Bexar County, VIA, SAWS, CPS, Drive Clean Across Texas and Alamo Tree Partnership. On their site you will find information on ridesharing, alternative fuels, and the Walk and Roll program. Pronounced (uh-Raw-sha meaning the Rock in Portuguese) and based in Fredericksburg, Texas, A Rocha USA is part of an international family of conservation organizations. 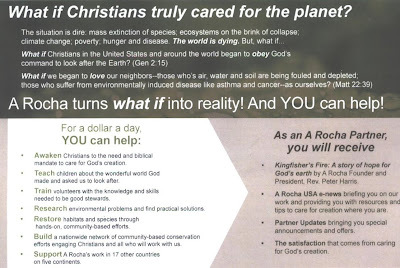 They work to present to Christians the biblical basis for environmental stewardship and the scientific understanding of the causes and effects of environmental degradation and the best methods for correcting it. Local communities in Santa Barbara and San Luis Obisbo, California, Boise, Idaho, Seattle and Lynden, Washington, Wilmore, Kentucky along with Fredericksburg, Texas take actions ranging from bird banding and trail repair to establishing community gardens as do A Rocha college chapters at Wheaton College, Asbury College, Grove City College, Westmont College, Grace College and Ohio State University. Their education program has numerous downloadable fun and educational activities for kids including building a caterpillar habitat and a making a window ledge grow bag. Every day it seems that progress is made in the production of some sort or renewable energy. But how can these energy sources be integrated into the power grid efficiently and effectively? At UTSA the Autonomous Control Engineering lab or at least part of it is looking into it. 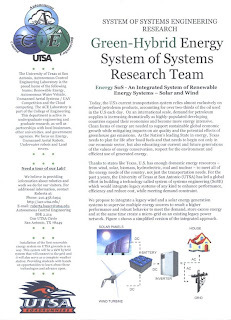 At the Fredericksburg Renewable Energy Roundup a UTSA student representing the department explained how his work involved looking into making the conversion of DC power to AC power and back again for some appliances more efficient. That is just part of a larger effort to build Energy System of Systems (SoSE) technology which would allow existing and new power sources to be integrated with improved performance and at a reduced cost. SoSE grew out of Defense Department needs to coordinate and integrate a large number of diverse systems in an environment of uncertainty. In recent years this approach has been applied to complex systems that arise when various systems interact with one another. The complexity itself creates uncertainty which the engineers must deal with, but in many environments the systems themselves are subject to change which creates even more uncertainty. UTSA professor and director of the Autonomous Control Engineering Center, Mo Jamshidi, Ph.D. is among the world's leading experts on SoSE. As we switch from a system in which our electrical energy came from a small number of roughly similar plants to a system that will include generators that harvest wind and solar power along with such seasonably variable sources as biomass energy the need for Systems of Systems Engineering will continue to grow. UTSA intends to be at the center of SoSE developments. 14th annual National Solar Tour to ramp up on October 3, 2009 highlighting new ways to save money on energy bills. Part of the world's largest grassroots solar event, the 2009 National Solar Tour is coming to San Antonio through the efforts of Solar San Antonio and the American Solar Energy Society (ASES). More than 150,000 will attend the ASES National Solar Tour to learn how to slash monthly utility bills and go green. The general public is invited to attend open-house tours of solar powered and energy efficient homes in some 3,000 communities in 48 states across the U.S. Locally, Solar San Antonio is bringing together 10 homes and businesses in Bexar County to help educate people about the benefits of solar in their homes. What: We invite you to join us and take self-guided tours to see how neighbors are using solar energy and energy efficiency to reduce their monthly utility bills and help tackle climate change - and how you can too! Meet San Antonio solar installers, get answers to your questions from homeowners, and learn what it means to go solar. What makes this event so powerful are the neighbor to neighbor discussions that can help you gain the insight needed to make smarter energy choices. When: Saturday, October 3rd from 10:00 a.m. to 3:00 p.m..
Where: Please visit www.solarsanantonio.org to download a tour map and brochure. We will also have these maps available at all tour locations. Cost: FREE to all attendees. With solar costs 30-40% lower than just a year ago and incentives now covering 1/3 to 2/3 the costs, more families and businesses are going green to save money during tight economic times. Federal incentives have increased significantly. CPS Energy currently offers a solar rebate program and will begin its Solartricity Producer Program in January 2010. Now is an excellent time to go solar and the National Solar Tour is an easy way to get started. The ASES National Solar Tour features property-owners who open their doors to neighbors to share how they are using the latest solar & energy efficient technologies to drastically reduce monthly energy bills, reduce harmful carbon emissions, and enjoy tax credits and cash incentives as they improve their property values. According to survey results from last year's National Solar Tour, 76% of participants said they are very likely to invest in solar or energy efficient technology after the Tour, compared to less than 50% before the Tour. A stunning 74% of participants indicated that they had never visited a solar or green-built home prior to this event. Last year's National Solar Tour attracted close to 140,000 people. Solar San Antonio would like to thank the homeowners and businesses that made this tour possible! Installers who are participating in this year's tour include Novastar Energy, Ecowatt Design, Standard Renewable Energy, Solar Specialty Products, and Meridian Solar. If you would like to volunteer at this year's tour we would love to hear from you. Please email cchapa@solarsanantonio.org or call our office at 210-354-0236. With more and more people in San Antonio raising the three chickens (or more) allowed by law, more and more people need coops. While it can be fun to build one yourself, Josh and Michelle Hudgins of Burnett, Texas are happy to build one for you. Alternatively they will sell you a coop in kit form. Some of their coops are mobile, chicken tractor style coops. As the chicken tractor is moved about a property, the chickens do their business of insect control, tilling and fertilization one small spot at a time. You can learn more about coops and mobile chicken coops at mobilechickencoops.com. In addition to the Honeywell home wind turbine a number of other innovative and improved wind turbines were on display at the 2009 Renewable Energy Roundup. Joe Kaminski of Wilson Energy demonstrated Aquilo Power's vertical windmill. Abundant Renewable Energy of Newberg, Oregon displayed their super strong power generating windmills. The Energy Ball windmill from Home Energy Americas LLC, (a division of Sweden's Home Energy) and installed by Round Rock's Casa Bella Verde operates at very low wind speeds. Tests indicate that it's sound is not detectable above background noise. San Antonio company Southwest Clean Energy also sells and installs the Energy Ball. Permeable concrete that allows water to pass through was on display at the 2009 Renewable Energy Roundup. Chino's Concrete of Austin put a slab of their concrete in a tank and poured water over it. A good portion of the water made its way through the concrete and into the lower portion of the tank. The concrete has no re-bar and looks like a conglomeration of small balls of concrete. When installing a permeable hardscape according to Brad Lancaster it needs to be installed so that it receives rainfall but not runoff, since runoff will contain matter that will eventually clog it up. So if it used for a sidewalk for instance it should be higher than the surrounding lawn. Some of us got our first look up close at the Windtronics home wind turbine that is being sold under the Honeywell name. Windbucks a Fredericksburg company that intends to become a certified installer had the turbine on display. It looks like a giant bicycle wheel with small pieces of plastic to catch the wind and make it spin. There are some magnets mounted at the top of the white fender-like frame. As the wheel spins past the magnets electricity is produced. A notice on the booth said that the installed cost for the turbine would be $5,200 after tax rebates. Residential Wind Turbines can qualify for a tax credit of 30% (including labor and materials with no maximum.) Of course talk to a trusted tax adviser before you make any purchase based on an expected tax credit. June 26 post on Honeywell turbine. This post continues to get lots of hits. I've been meaning to do another one based on my conversations with the folks at Windbucks at the 2010 Renewable Roundup but since folks are still coming to this post I think I just zip out a few paragraphs here. According to the guys at Windbucks, the white model was not ever made available for sale. It didn't pass muster somehow. The new model (the black one) has passed muster though and Windbucks folks will do a turn key installation on it. As best I can tell it is a bit larger than the previous model. I believe the specs on it are a bit different as are the suggested uses. It is still able to generate power with a light breeze and it has the same basic design principles as the 2009 model but it seems stronger and more substantial in 2010. Here is a neat idea. The electric Yike Bike folds into a two foot by two foot space. (It takes 20 seconds or more to fold it.) It travels up to 6 miles at a maximum speed of 12 miles per hour and will cost 3,900 euros ($5700 USD) when in goes on sale in mid 2010. It can carry up to 220 pounds. It won't be sold initially in the USA. Here's a link to the YIKE BIKE YouTube Channel. This course has already started and it is probably too late to attend but it sounded interesting so I wanted to include information on it on the chance that you may be able to catch the last three sessions. Call the SolCenter office (210-732-9920) to find out. In this class, we will explore our interconnectedness and interdependence with the natural world through two lenses: 1) New legal approaches and 2) The needs of the Edwards Aquifer. We will share moments of prayer, reflection, and discussion based on short readings. Each of the four sessions will explore a specific approach - regulation, property, precaution, and rights - and several strategies within each approach, considering ways each strategy might or might not help the Edwards Aquifer. Participants should attend the films, Trouble the Water, on August 29, 6:30 p.m. and Hurricane Ike Documentary on September 13, 6:30 p.m. This course is for any interested person who wants to further his or her Earth literacy and is curious why the legal system is not better protecting the Earth: teachers, grant funders, religious leaders, policy makers, activists, attorneys, volunteers, and students. About the instructor: Libby Comeaux, a Texas native and Colorado lawyer, recently spent a year in Miami and Orlando at the Center for Earth Jurisprudence, founded as part of the Great Work envisioned by the late Thomas Berry. The Sol Center, part of University Presbyterian Church located adjacent to Trinity University, is offering a unique examination of water issues entitled "Earth, Water, and Working for the Seventh Generation". The presentations will take place from 7 to 9 pm each Tuesday in October. Tuition is $45 and the deadline for registration is September 29, 2009. Presenters include Alyssa Burgin and Sisters Linda Gibler, Elise Garcia and Carol Coston and Dianne Monroe who will participate in a panel discussion for the October 6 session. The second session, Water: Cosmic & Sacred Stories, on October 13 will be led by Sister Linda Gibler OP. She will trace the scientific and sacred stories of water from the Big Bang to today. Alyssa Burgin will lead the October 20 session, "Water, water, everywhere, nor any drop to drink”, which will address the irony of water shortage in a time of rising seas which will "inundate coastal communities by the year 2100. Under the same sky, we will face a situation in which the Chihuahua Desert will expand farther eastward through West Texas." Sister Elise Garcia, OP and Sister Carol Coston will give a presentation on about a nearby ecological model of living more lightly (using less water) on Earth, Santuario Sisterfarm . Here is a link to registration. Call the SolCenter office (210-732-9920) if you have questions or concerns about your registration. The Headwaters Coalition, the group established by the Sisters of Charity of the Incarnate Word to protect the remaining parts of the headwaters of the San Antonio River on the grounds of theUniversity of the Incarnate Word, is in the process of finding a new director due to the departure of Lacey E. Halstead for a new position in Virginia. Her departure comes soon after the completion of a Sanctuary Master Plan for the property. CPS Energy has been forced to postpone the upcoming LiveGreenFest at Olmos Basin Park due to last weekend’s heavy rains and flooding as well as more rain in the forecast this week. CPS Energy regrets having to postpone the event and will look for a future date to continue the tradition of offering a showcase of energy efficiency and conservation opportunities to help customers save energy and money. The event had been planned for this coming Saturday, Oct. 10, from 10 a.m. to 4 p.m. Details of a rescheduled event will be distributed when they become available. Do you consider yourself environmentally conscious? 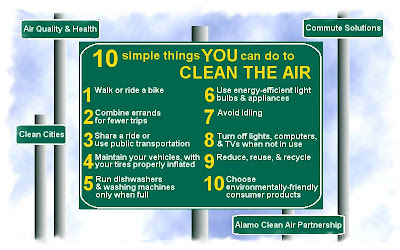 Maybe you ride the bus to save money and reduce air pollution. Maybe you're committed to recycling. Or, perhaps, you’re one of CPS Energy’s Windtricity® customers who believe renewable energies are a viable option to fossil fuels. If so, you’re making a difference. But what else can you do to achieve that full-fledged green status? * Speak with dozens of businesses and organizations eager to offer tips on green building, energy efficiency, water conservation, recycling, commuting solutions, alternative energy ideas and earth-friendly products. * Get a free emissions test for your vehicle from AACOG. * Bring your kids by the San Antonio Library's Scholastic School Bus that will be loaded with environmental information suited for them. * Take advantage of a variety of green activities and crafts for the kids. * Drop off used clothing and household goods to be recycled through Goodwill. The event is free, so make it a full day in the park and also enjoy live music, food and drink. Parking is available near the park (see map), or try Alamo Stadium and take a free shuttle bus to the event. The 'Owner Builder' is the most in-depth workshop we offer. This workshop will be a hands-on building intensive and is designed to prepare you to build you own cob home. This workshop will take place in a beautiful wooded setting next to a lake. You will learn all the basics of building with cob for anything from a small outbuilding to your entire house. In this workshop we will actually construct an entire cob cottage from the ground up! You will have the chance to get hands on experience with every stage of cob building so you can go home with the confidence and skills to build your own house. We will cover foundations, walls, windows, doors, roofs, plasters, sculptural work, testing your cob mix, using a tractor to mix cob, passive solar design, rainwater collection, dealing with the building department, electricity, plumbing and more! This is an ideal workshop to take if you are considering building your own cob home or any fully enclosed building. Workshop fee includes all vegan friendly, mostly organic, 'whole food' meals with raw chocolate served daily, from dinner October 21 to breakfast October 30, morning yoga classes and camping! An extension cord is available for your tent for $10.00 or your R.V. for $20.00. We offer some discounts for families and groups of 3 people or more. This workshop can be paid for over the phone with a credit card. Receive a 10% discount if you mention Design Build Live of Austin. On Saturday October 3 from 10 to 11 am, Audubon Texas director of conservation and education, Iliana Pena will present a program about climate change, its causes and effects and how you can make positive choices for our environment as a part of the Mitchell Lake Audubon Center's series of family oriented program. Because space is limited, RSVP is required although the workshop is free. To register email the Mitchell Lake Audubon Center . Registration required. To register, click HERE. If you don’t already have a DBL account, you will be asked to create an account. Once you have created an account and are logged in, select “Current Events” from the “What would you like to do?” pull down menu. Visit the Barefoot Builder website for details. The cottage is in Smithville which is southeast of Bastrop on the road to La Grange. As the builders of the Alamodome learned when they had to deal with lead contaminated soil and as the developer of the former Big Tex vermiculite plant site which was contaminated by W R Grace Company learned, building on a site that has already been occupied can have its challenges. The Brownfields 2009 conference Sunday November 15 through November 18th in New Orleans will address many of the issues associated with the redevelopment of abandoned, underutilized, and potentially contaminated properties in the nation. The conference will include over 150 educational sessions, film screenings, a large exhibitors hall and more. Best of all registration is free. The view from the Tower of the Americas reveals a huge number of flat roofs, mostly on commercial buildings. Since San Antonio does get rain, (except for during the Summer of 2009), flat roofs generally involve a lot of maintenance, a lot of tar and a lot of gravel. Being dark they also don't tend to reflect much of the sun's heat. A completely white flat roof would be an advantage, and that is what is sold locally by Jaco-Roofing, whose slogan is "White=Green". The Duro Last Cool Zone prefabricated flat roof white vinyl roof membrane system has a retained reflectivity of 85% or more after three years. The membrane consists of PVC resins, plasticizers, stabilizers, biocides, flame retardants and U.V. absorbents. By prefabricating the membrane under ideal factory conditions they are able to decrease field labor costs and increase quality. Though the membrane is available in several colors. The white version is being promoted to counteract the urban heat island effect. 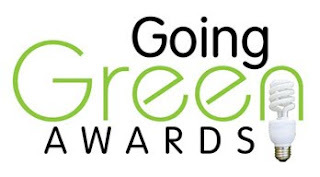 The San Antonio Business Journal is hosting the first annual "Going Green Awards" in San Antonio. It's easy to think green. But doing green? That takes some planning, patience and some serious elbow grease. For the first time ever, the San Antonio Business Journal presents the 2009 Going Green Awards, recognizing individuals, companies and programs making an effort to save our planet. Please joing us as we honor the winners on Thursday, October 22, 2009 at Pearl Stable located at 312 Pearl Pkwy Bldg #2. Registration will begin at 11:30 am following with the luncheon and program at noon. The 2009 Going Green Awards are hosted by the San Antonio Business Journal and co-sponsored by Wittigs Office Interiors l Haworth, Greenstar and Jaco-Roofing. Presenting sponsors include: Sustainable Prespectives Group, USAA Real Estate Co., Holiday Inn San Antonio International Airport, Concord Property Corp., Four Seasons Sunrooms of Texas, Weston Solutions and M.O.T & Associates. Our Association Partners are AIA San Antonio, U.S. Green Building Council, Central Texas chapter and Build San Antonio Green. Please make your reservations by Oct. 15th. For more information contact Dariela Trevino at (210) 477-0855 or via email.